Just because we make jewelry inspired by museum pieces doesn’t mean we do everything old-fashioned. Brian wouldn’t want to polish stones by rubbing them against another rock, and you can have my jeweler’s saw when you can pry it from my cold, dead fingers. On that note, we recently acquired a piece of modern equipment that will help us take our jewelry to the next level! Well, now I can transfer my hand drawings to metal. That means I can engrave, saw and even do acid etching a million times faster than before. But the big kicker is that now I can easily add enamels to my work in ways that won’t make your wallet cry. You get really authentic, REAL glass enameled jewelry, just like what your persona would have worn, and I get to feed the Little One and have electricity and make more beautiful things. Here’s my first test piece, along with a little pendant I made to go with it. 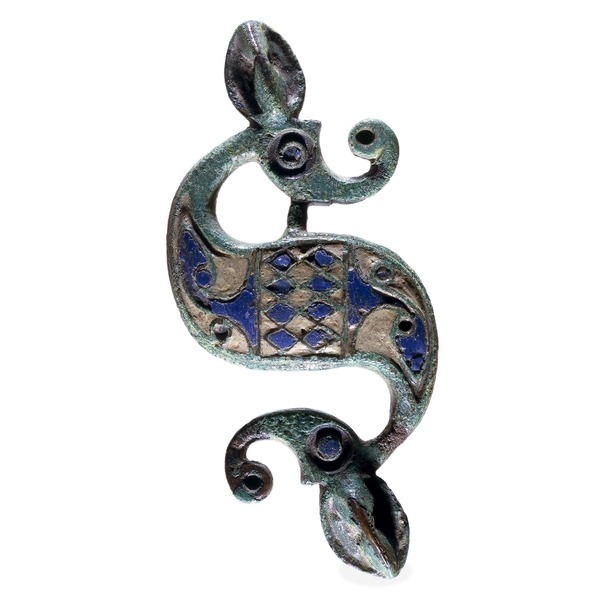 It was inspired by this brooch from Roman Britain. Look for some gorgeous antiqued and enamelled pieces in the shop soon!